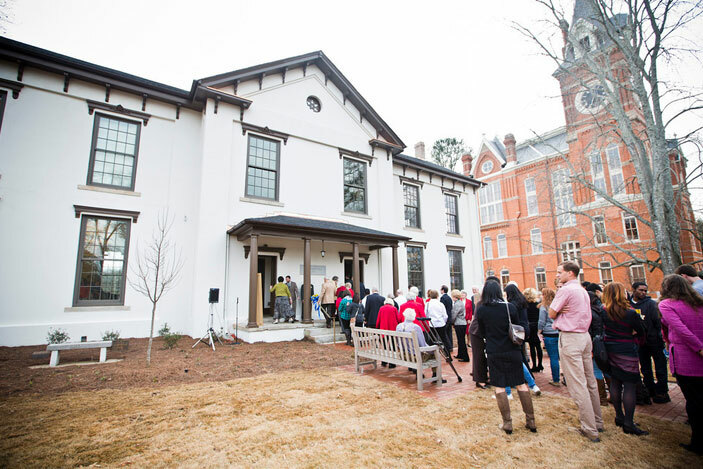 A grand opening and ribbon-cutting ceremony for the Oxford College's Language Hall on January 13 brought together the project's participants. 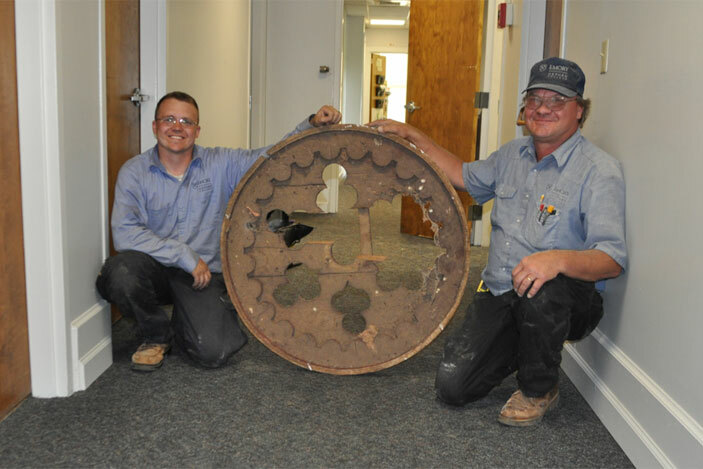 Gary Brown (left) and Al Mitchell, of Oxford's facilities management team, are seen holding a handmade, decorative cover that fit the gable vent on the building's north side. The cover was restored, and it is now back in its original place. When layers of drywall were removed from classroom walls, several original blackboards were revealed. One of them still bore an inscription, "Smith. Oxford, Ga. June 26, 1941. Be sure you are right. Then go ahead." Other found items include patent-medicine bottles, handmade nails and iron joists. In the first-floor entry, a flat-screen monitor provides visitors with building and campus directories with touch technology. Drop ceilings that were installed years ago were removed, and the original ceiling height of more than 12 feet has been restored. This allows for the original large window openings to be fully used, creating spaces filled with natural light. The four classrooms are enhanced with interactive whiteboards or podiums powered by SMART Technologies. The Oxford Library and Academic Commons is under construction and on track for completion by early May. The new facility incorporates the basic structure of the old library building, built in 1970, and a 10,000-square-foot addition. Construction will begin in early summer on a new 208-bed residence hall, which will be built on the north side of Hamill Street, across from East Village residence hall. Schematic design is under way on a new science building, with start of construction targeted for summer 2014. The site is on the northwest corner of the quad, adjacent to Phi Gamma Hall. Following extensive restoration, Oxford College's Language Hall has re-opened for spring semester 2013. 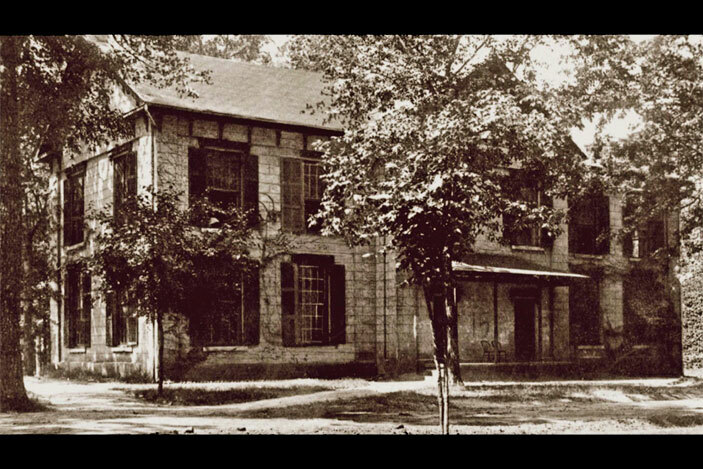 Built in 1874, the building was variously divided during the twentieth century into small classrooms and smaller offices. Following six months of work, Language Hall is restored to its original floor plan, with two spacious classrooms on each of two floors, and an addition provides new faculty offices and ancillary space. "After months of evaluating the historic structure, strengthening it with modern materials, and building modern classrooms that make the most of the gracious original building while providing a twenty-first-century teaching environment, Language Hall is now one of the most beautiful and well-equipped buildings on Oxford's campus," says Stephen H. Bowen, dean of Oxford College. 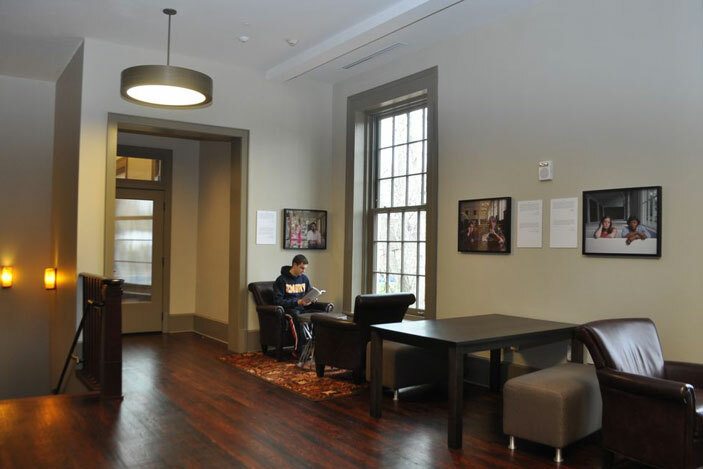 "Myra Frady, dean for resource planning and CFO, and her team have taken great care to honor the history and heritage of Language Hall while also providing the infrastructure and interior design that make it a twenty-first century learning environment with a fresh, modern aesthetic." Participants in the project included architectural firm Lord Aeck and Sargent and Juneau Construction, both of Atlanta. Language Hall's exterior finishes were selected following research into the building's original design. Corbels and window pediments are painted a deep brown in contrast to the lighter color of the walls. Chimney-like brick structures were added to the roof in homage to the building's original, working chimneys. An addition to the building's south side fits seamlessly with the original building and provides six new faculty offices. Language Hall has been reconfigured into four large classrooms, two on each floor. Drop ceilings that were installed years ago were removed, and the original ceiling height of more than 12 feet has been restored. This allows for the original large window openings to be fully used, creating spaces filled with natural light. Layers of flooring were removed to reveal the building's original heart-pine floors. While classroom floors are covered with low-pile carpet to minimize noise, the restored original floors have been left exposed in public areas such as halls and landings. The restoration also puts Language Hall in line with ADA accessibility standards. An elevator for the two-story building has been installed, and a ramp to the east entrance makes it wheelchair-accessible. 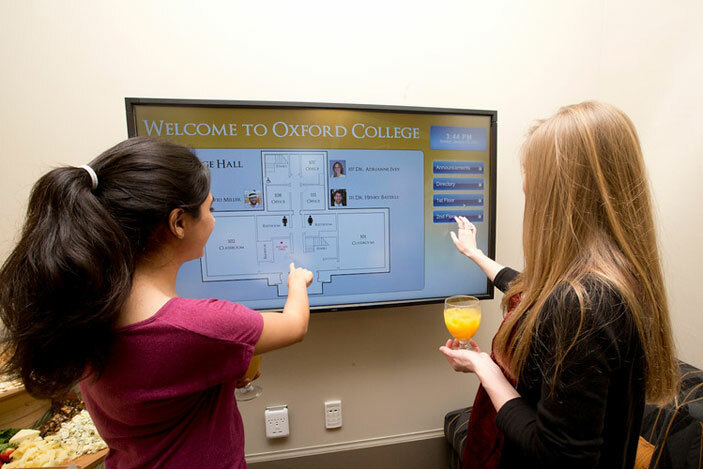 In the first-floor entry, a flat-screen monitor provides visitors with building and campus directories with touch technology. The monitor also serves as a rotating calendar of campus events. The four classrooms are enhanced with interactive whiteboards or podiums powered by SMART Technologies. 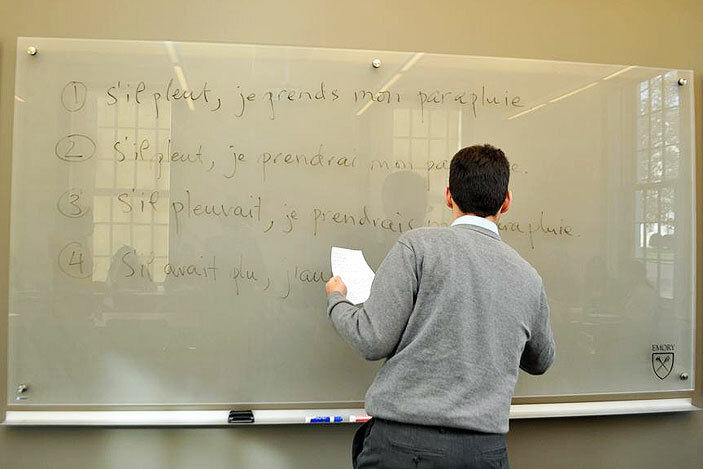 This enables instructors free-form writing and interaction with content on the dedicated computer, which is simultaneously displayed on a large 125-inch motorized screen. One of the Language Hall classrooms is also enhanced with a lecture-capture device that allows instructors to easily record their classroom teaching in both audio and video, using a touch-panel control system. Recorded video can then be easily distributed online for students to review later. In the entry of Language Hall's first floor, a portrait bust of the philosopher Plato is on display. The bust was cast from one in the collection of the Antikenmuseum in Basel, Switzerland, that is a Roman copy of a work by the Greek sculptor Silanion. The piece was acquired in tribute to the history of Language Hall, so named because it originally housed classes in English, modern languages, Greek and Latin. Peter Bing, Samuel Candler Dobbs Professor and chair of classics; and Jasper Gaunt, Carlos Museum curator of Greek and Roman art, coordinated the selection and acquisition of the bust. Inscribed in Greek and English on the pedestal holding the bust is a quotation from Plato's Republic, selected by Oxford assistant professor of classics Henry Bayerle: The beginning in every task is the chief thing. Throughout the building hang 18 photographs by internationally recognized photographer Dawoud Bey. In 2010, Bey was commissioned by Emory University's Transforming Community Project to develop a series of double portraits that explore Oxford's and Emory's historic and current experiences with race, gender, sexuality and other forms of human difference. These photographs are now part of the Oxford College permanent art collection. 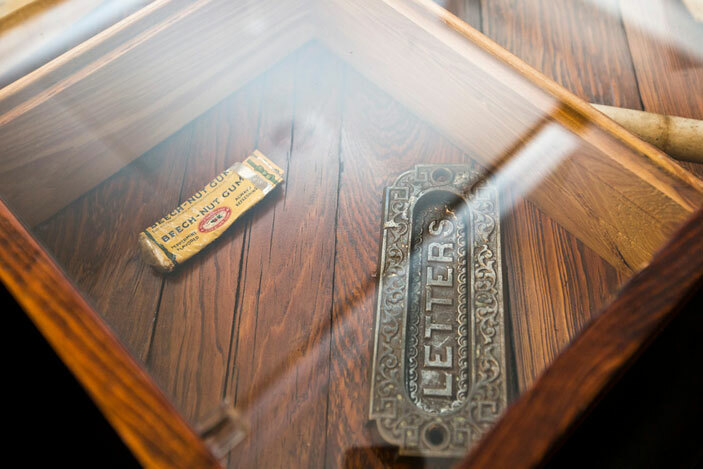 During the six months of restoration, work crews unearthed several artifacts from the building's past. Removal of the original plaster ceiling and lath on the first floor revealed beams that had clearly been re-purposed from another building. The consensus is that they were from Old Main, Emory College's first administrative building, which was demolished in 1872. Inspecting the building just prior to the project's start, architects from Lord, Aeck and Sargent found in the Language Hall attic part of a decorative cover that fit the gable vent on the building's north side. This was clearly handmade, and early photographs of Language Hall confirmed that it or a cover like it had been used in the building. Using that photograph as a guide, the cover was restored, and it is now back in its original place. 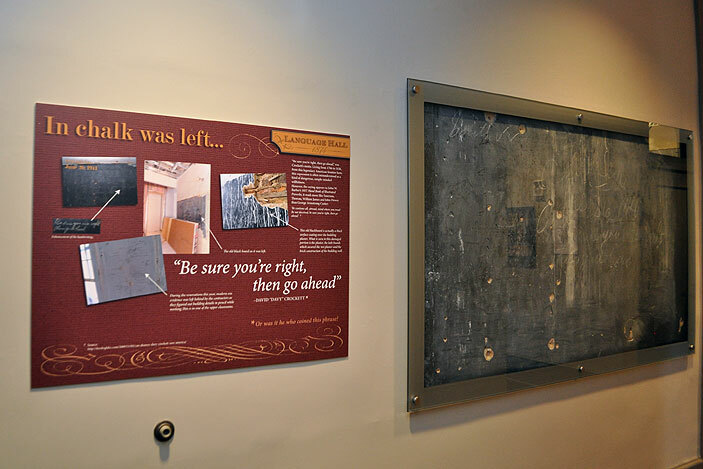 When layers of drywall were removed from classroom walls, several original blackboards were revealed; these were not of slate, but rather were of plaster tinted black and applied with the rest of the wall plaster. One of them still bore an inscription, "Smith. Oxford, Ga. June 26, 1941. Be sure you are right. Then go ahead." The quotation is attributed to Davy Crockett, but there is no clue as to who wrote it on the board, which is now on display behind glass on Language Hall's second floor. Other found items include patent-medicine bottles, handmade nails and iron joists. A display on Language Hall's second floor highlights some of these objects. In keeping with Emory and Oxford's commitment to sustainable practices, Language Hall is designed with many resource-saving features. These include low-flow plumbing fixtures, a hydration station that encourages the use of personal water bottles in lieu of bottled water, a highly efficient HVAC system and motion-activated lighting. A grand opening and ribbon-cutting ceremony on January 13 brought together the project's participants: Oxford faculty, staff, alumni and students; and representatives from the Oxford and Covington communities.